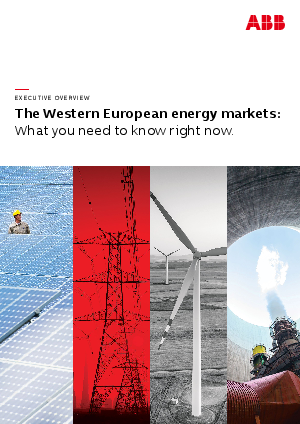 > ABB > EXECUTIVE OVERVIEW The Western European energy markets: What you need to know right now. European energy markets are undergoing many changes in order to adapt themselves to dynamically-evolving market conditions. Renewable generation capacity continues to rise in the Western European market, bringing more intermittency to the power system. Meanwhile, conventional power plants, fueled by coal, lignite or uranium, are being decommissioned more often among western countries, affecting the security of supply and reserve margin levels. These changes need to be introduced and maintained by system operators, and each country has a slightly different approach to the challenges. ABB has the ability to analyse the impact of energy storage on the energy markets (how it can change energy prices and incentives ) and the dynamics of investments across European investment strategy. The possibility of storing energy on a large scale would significantly speed up renewables development, as the intermittent sources’ capacity would no longer have to be backed up by conventional power plants. Eventually, this could lead to abandoning expensive fossil fuels in favour of renewables with a lower marginal cost of generation and dynamically decreasing investments costs. Ultimately, the key for large energy consumers is analysing long-term price or power purchase agreements and how storage can help large consumers to better manage their consumption and market risks.